These luxury, detached, 12-person holiday homes at the Poort Van Amsterdam Resort are all located along the water and are available in two different layouts. The first type is called the Westertoren (mh48471). This is built in a style typical of the area and features a bedroom with en-suite bathroom on the ground floor. On the first floor, there are five bedrooms and two bathrooms. 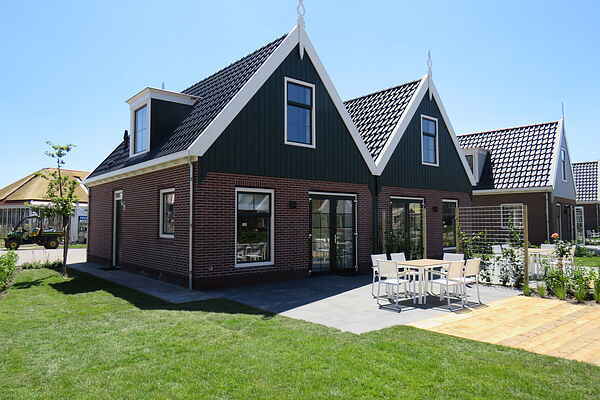 The Geschakelde Munt type (mh48472, mh48480, and mh48481) consists of two holiday homes of the Munt type (mh48467). The homes are connected to each other by a soundproof door in the living room. This means you will, in fact, have access to two fully furnished homes (two kitchens, two living rooms, etc.). It is perfect if you are going on vacation with two families, but still want some privacy. The ground floor has two bedrooms and two bathrooms. On both of the first floors (which are not connected to each other), there are a total of four bedrooms and two bathrooms. All houses are furnished in a modern and comfortable manner. They contain a luxury kitchen with microwave and dishwasher. The bedrooms are furnished with comfortable box-spring beds. There is a lovely garden with a terrace and garden furniture as well as parking spaces for three cars at each home. At the Poort Van Amsterdam Resort, there are also has 6-person and 8-person holiday homes for rent. Would you rather book an apartment? This is also possible; there are apartments for 4, 8, 10, and 12 people.